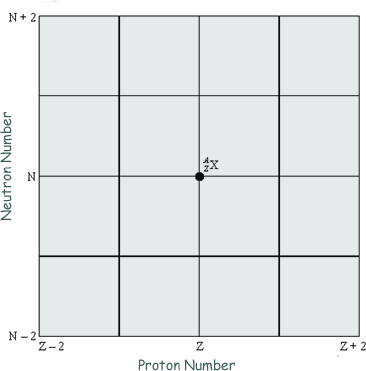 (i)	Sketch a graph to show how the neutron number, N, varies with the proton number, Z, for naturally occurring stable nuclei over the range Z = 0 to Z = 90. 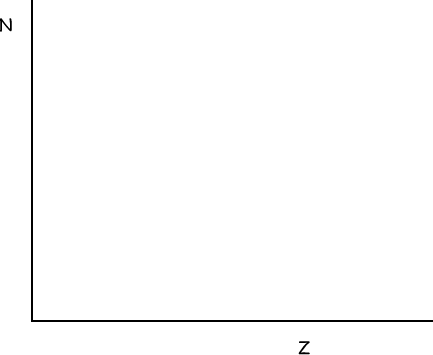 Show values of N and Z on the axes of your graph and draw the N = Z line. (i)	What is meant by the random nature of radioactive decay? 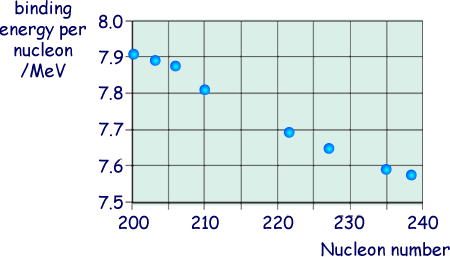 (a)	Nuclear fission can occur when a neutron is absorbed by a nucleus of uranium-235. An incomplete equation for a typical fission reaction is given below. (i)	State the nuclear composition of X.
Q4.The radioisotope iodine-131 is used in medicine to treat over-active thyroid glands. It decays into an isotope of xenon (Xe) by β– emission with a half-life of 8.1 days. 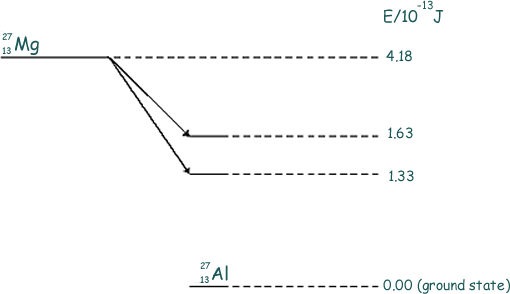 The xenon subsequently emits a γ ray. (b) Write down the equation which represents the nuclear reaction. (c) Calculate the time (in days) for a sample of iodine to decay to 1% of its initial activity. (d) State and explain which decay product can be detected outside the body during treatment. (a)	The diagram is copied from a photograph taken of a cloud chamber containing a small radioactive source. (i)	What type of radiation is emitted from the source? (ii)	State and explain what can be deduced about the energy of the particles emitted by the source. (b)	Plutonium–239 is a radioactive isotope that emits particles of energy 5.1 MeV and decays to form a radioactive isotope of uranium. This isotope of uranium emits particles of energy 4.5 MeV to form an isotope of thorium which is also radioactive. (i)	Write down an equation to represent the decay of plutonium–239. (ii)	Write down an equation to represent the decay of the uranium isotope. (iii)	Which of the two radioactive isotopes, plutonium–239 or the uranium isotope, has the longer half-life? Give a reason for your answer. (iii)	the initial number of undecayed nuclei present at time t = 0. (b)	Each decay releases 1.0 x 10–12J. (iii)	 emission, labelling the region C.
Q8. The radioactive isotope of sodium has a half life of 2.6 years. A particular sample of this isotope has an initial activity of 5.5 × 105 Bq (disintegrations per second). (a)	Explain what is meant by the random nature of radioactive decay. 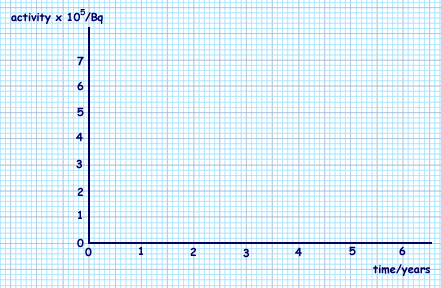 (b)	On the axes below, sketch a graph of the activity of the sample of sodium over a period of 6 years. 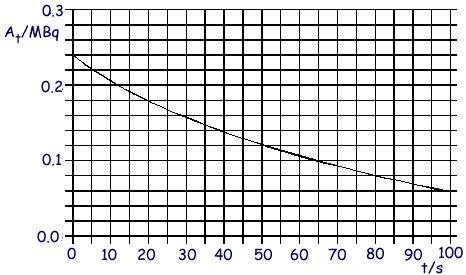 (iii)	the time taken, in s, for the activity of the sample to fall from 1.0 × 105 Bq to 0.75 × 105 Bq. 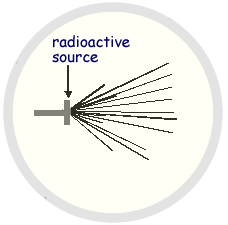 (a)	A radioactive source gives an initial count rate of 110 counts per second. After 10 minutes the count rate is 84 counts per second. (i)	Give three origins of the radiation that contributes to this background radiation. (ii)	Calculate the decay constant of the radioactive source in s–1. (iii)	Calculate the number of radioactive nuclei in the initial sample assuming that the detector counts all the radiation emitted from the source. (b)	Discuss the dangers of exposing the human body to a source of radiation. In particular compare the dangers when the source is held outside, but in contact with the body, with those when the source is placed inside the body. (a)	Sketch, using the axes provided, a graph of neutron number, N, against proton number, Z, for stable nuclei over the range Z = 0 to Z = 80. 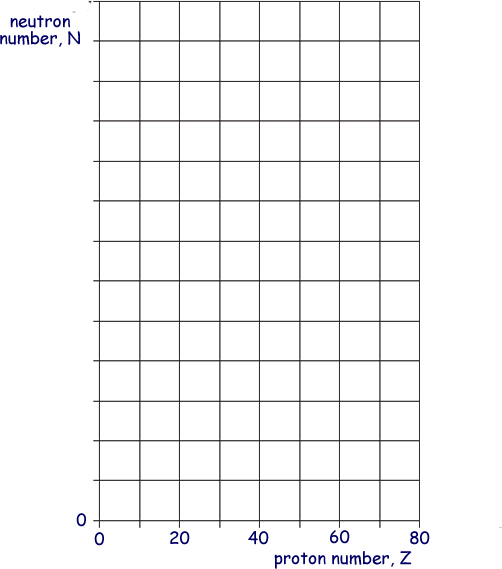 Show suitable numerical values on the N axis. (iii)	 emission, labelling the position with Y. (c)	The isotope decays sequentially by emitting particles and particles, eventually forming the isotope . Four particles are emitted in the sequence. Calculate the number of particles in the sequence. (d)	A particular nuclide is described as proton-rich. Discuss two ways in which the nuclide may decay. (a)	Suggest two reasons why an particle causes more ionization than a particle of the same initial kinetic energy. (b)	A radioactive source has an activity of 3.2 × 109 Bq and emits particles, each with kinetic energy of 5.2 Me V. The source is enclosed in a small aluminium container of mass 2.0 × 10–4 kg which absorbs the radiation completely. (i)	Calculate the energy, in J, absorbed from the source each second by the aluminium container. (ii)	Estimate the temperature rise of the aluminium container in 1 minute, assuming no energy is lost from the aluminium. Q12. The isotope of uranium, , decays into a stable isotope of lead, by means of a series of α and β– decays. (a) In this series of decays, α decay occurs 8 times and β– decay occurs n times. Calculate n.
(i) Explain what is meant by the binding energy of a nucleus. (ii) The graph belowshows the binding energy per nucleon for some stable nuclides. Estimate the binding energy, in MeV, of the nucleus. (c) The half-life of is 4.5 × 109 years, which is much larger than all the other half-lives of the decays in the series. A rock sample when formed originally contained 3.0 × 1022 atoms of and no atoms. At any given time most of the atoms are either or with a negligible number of atoms in other forms in the decay series. 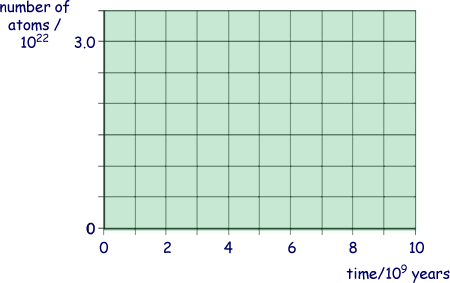 (i) Using the axes below, sketch graphs to show how the number of atoms and the number of atoms in the rock sample vary over a period of 1.0 × 1010 years from its formation. Label your graphs U and Pb. 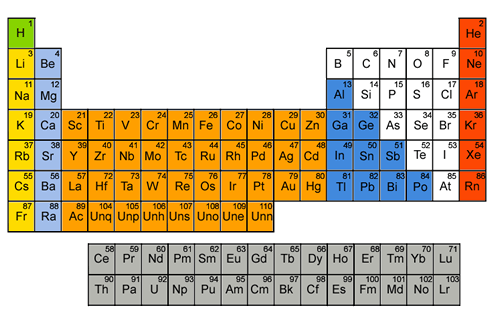 (ii) A certain time, t, after its formation the sample contained twice as many atoms as atoms. Show that the number of atoms in the rock sample at time t was 2.0 × 1022. (iii) Calculate t in years. (a) An unstable nucleus, , can decay by emitting a β– particle. (i) What part of the atom is the same as a β– particle? (ii) State the changes, if any, in A and Z when X decays. (b) In the process of β– decay an anti-neutrino is also released. (i) Give an equation for this decay. (ii) State and explain which conservation law may be used to show that it is an anti-neutrino rather than a neutrino that is released. (iii) What must be done to validate the predictions of an unconfirmed scientific theory? (i) β– emission (label this arrow A), neutron emission (label this arrow B), electron capture (label this arrow C). (ii) Give the equation for electron capture by the nucleus X. (b) When decays to by β– decay, the daughter nucleus is produced in one of two possible excited states. These two states are shown in below together with their corresponding energies. (i) Calculate the maximum possible kinetic energy, in J, which an emitted β– particle can have. (iii) Calculate the frequency of the most energetic photon emitted. (i) State and explain two precautions that should be taken when working with a sample of in a school laboratory. (ii) Discuss which of the two types of radiation, β– or γ, emitted from a sample of would be the more hazardous. (a) Calculate the radius of the nucleus. (b) At a distance of 30 mm from a point source of γ rays the corrected count rate is C.
Calculate the distance from the source at which the corrected count rate is 0.10 C, assuming that there is no absorption. (c) The activity of a source of β particles falls to 85% of its initial value in 52 s.
Calculate the decay constant of the source. (d) Explain why the isotope of technetium, Tc 99m, is often chosen as a suitable source of radiation for use in medical diagnosis. On the grid draw three arrows to represent one possible decay route. Label each arrow with the decay taking place. (b) The copper nuclide may decay by positron emission or by electron capture to form a nickel (chemical symbol - Ni) nuclide. Write the two equations that represent these two possible modes of decay. (c) The nucleus of an atom may be investigated by scattering experiments in which radiation or particles bombard the nucleus. Name one type of radiation or particle that may be used in this investigation and describe the main physical principle of the scattering process. State the information which can be obtained from the results of this scattering. Q17. The first artificially produced isotope, phosphorus-30, was formed by bombarding an aluminium-27 isotope,with an α particle. (a) Complete the following nuclear equation by identifying the missing particle. (b) For the reaction to take place the α particle must come within a distance, d, from the centre of the aluminium nucleus. Calculate 'd' if the nuclear reaction occurs when the α particle is given an initial kinetic energy of at least 2.18 × 10–12 J. (i) Complete the table below showing the typical maximum range in air for α and β particles. (ii) γ rays have a range of at least 1 km in air. However, a γ ray detector placed 0.5 m from a γ ray source detects a noticeably smaller count-rate as it is moved a few centimetres further away from the source. (c) Following an accident, a room is contaminated with dust containing americium (which is an α-emitter). Explain the most hazardous aspect of the presence of this dust to an unprotected human entering the room. or questions relating to practical experiments with radioactive isotopes.